Tired of seeing outbound NTP blocks in your firewall logs because you restrict outgoing traffic? Or maybe you are receiving alerts because some device uses NTP pool resources (such as pool.ntp.org) and one of those IP addresses has ended up on a blacklist, blocklist, threat intelligence feed, etc? 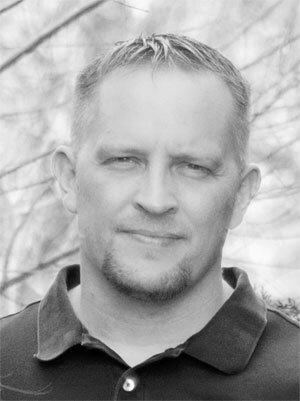 Either way, few things in the life of an IT or security professional are as frustrating as false positives. This write-up will help you change that with a little NAT magic, aka redirection. First and foremost, if you can modify the device’s NTP server please make the modification there instead! This post is for the times where that is not possible. As shown in the commands below, running ntpdate to sync your time against a non-blocked hostname or IP address returns the time offset without issue. However, running the same command against a known blocked IP address just adds to your count whether it is firewall blocks, pfBlockerNG, Snort, or Suricata. What to do? Just add NAT! Only instead of creating an incoming NAT rule from the WAN as your are accustomed to doing, you will instead redirect all outgoing NTP traffic to the IP address of the firewall (or other internal NTP server of your choice). You can also use 127.0.0.1, which basically tells your firewall to redirect to itself. These are the steps to create NTP NAT rules on a pfSense, but this should work for nearly any firewall. 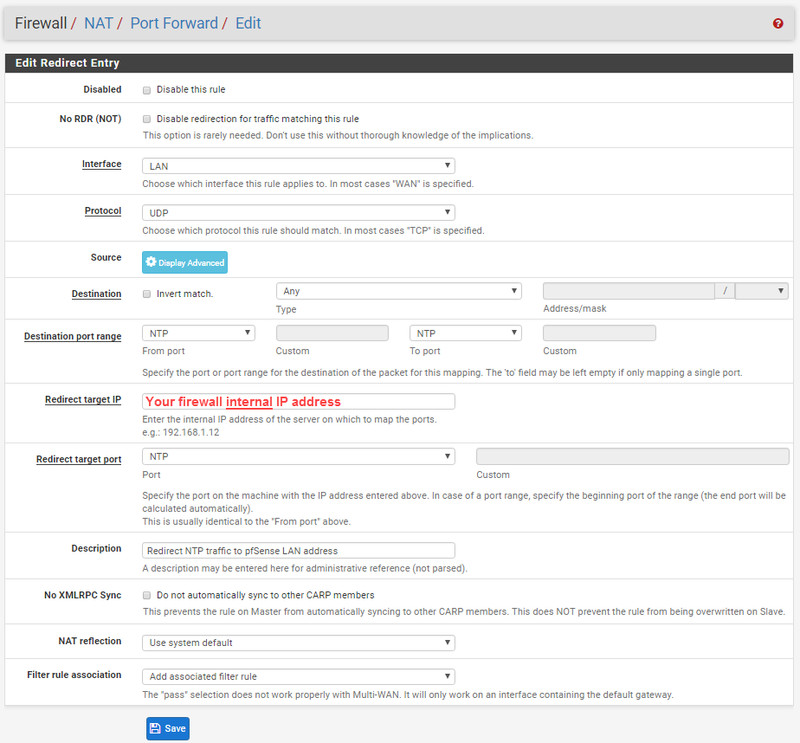 For pfSense, go to Firewall -> NAT and then Add (Up arrow). Type in the info similar to what you see below. Next, go to Firewall -> Rules and then select your interface (such as LAN). The firewall rule will be automatically created by the NAT addition, but you will need to move the firewall rule up. You could move it to the top, but if you happen to have an ‘allow all’ rule then you *should* at least need to make sure it is above that rule. Note: If your ‘allow all’ rule is above the NTP rule, your NTP redirection would still work. However, you should get used to ordering rules properly. In addition, you won’t see the counters on the left-hand side of the rule increment, which are great to help you easily determine if it is working. What you will end up with is something like what you see below. Make sure you hit Save! A quick retest trying to sync time against the previously blocked IP will provide a little different result this time around because the traffic is redirected to your firewall instead of the actual IP address. Only add this rule if you need at least one system on your local network to access an outside NTP server. I use Nagios heavily to monitor my environments. One of my standard Nagios checks is to check a system against an outside NTP server. After all, what good is it to test all of your time against one server and one server only? The above NAT rule would break this functionality that otherwise verifies my system times are not only synced, but correct. The way to get around this is to create an alias and an invert rule. The resulting NAT rule only works when the destination address is not time.google.com. 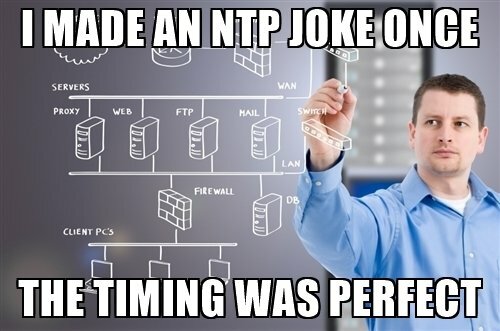 For example, if a system on that segment tries to access pool.ntp.org, it will receive it’s time from the firewall because of the redirection/NAT rule. First, create an alias for the NTP servers you want to query directly . Once again, in my case, I only plan to bypass the previously created rule when querying time.google.com. To create the alias, go to Firewall -> Aliases and click “Add” as you normally would. I’ve named my rule TimeGoogleCom, but you can name your alias anything. Go to Firewall -> Nat and then Add (Up arrow). You would select all the same same options as above with the exception of the destination line (highlighted). You would need to check “Invert match,” select “Single host or alias” and then type in your alias. If you want to further limit which systems can perform this check, you could add an individual IP address or alias in your source address for this rule. I created a separate NAT rule for another VLAN segment so you can see how the LAN rule is different from it. The alias is clearly listed, but it also has the exclamation point to show it as a “not” (inverted) statement. Don’t forget that you still need the corresponding firewall rule above other rules that could potentially break it! I ran a package capture on the WAN interface while running the ntpdate command against the CentOS pool and then time.google.com. Notice only the packets to time.google.com were sent out the WAN because the other port 123 (NTP) traffic never left the firewall. Super simple, yet ridiculously effective! I think there is no need to enable an associated filter rule when you create the port forward rule, because thanks to the Default allow LAN to any rule, NTP queries are already allowed to pass. That’s a great point! I updated some verbiage in the guide based on your recommendation. That said, even if someone is using an ‘allow all’ rule, I recommend they order the rules properly. Why? First, it allow you to see the counters off to the left so at a glance you can easily see if the rule is working. I’ve worked on firewalls with 3000+ rules and counters are often how you can determine if a rule is ‘hidden’ by other rules. Second, at some point the ‘allow all’ might change to a ‘deny all’, i.e. it really helps to get used to rule placement for when it really matters. 😉 Thanks for the feedback and I hope it helped! I am doing exactly the same on my firewall but am using 127.0.0.1 instead of the firewall’s internal IP address. I also have the similar NAT redirect rule for DNS in order to make sure all my machines resolve to same IP addresses. Using 127.0.0.1 is counter-intuitive but I found it in the pfSense knowledge base and it does work correctly. Thanks for the feedback! 127.0.0.1 should work fine as well. It may actually be the better option depending your configuration. I added a comment about using 127.0.0.1 in the write-up. I do the same with DNS. I’m actually about 1/2 thru a new write-up on configuring DNS and *trying* to prevent DNS over HTTPS, DNS over TLS, etc.